Joseph Horn was born in Germany and Frank Hardart began his life in New Orleans, Louisiana, but they opened their first Automat in Philadelphia’s bustling Center City in June 1902. They modeled the Automat, a waiterless restaurant, after the successful Quisisana Automat in Berlin. Horn helped to popularized their brand by selling New-Orleans style coffee. This location, on the 800 block of Chestnut Street, was the first Automat Horn and Hardart opened. By 1963, when this photo was taken, the American automat had developed a distinctive art deco and chrome style. 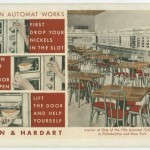 As the H&H Automat gained popularity, Horn and Hardart were able to expand, opening dozens of new restaurants in Philadelphia and New York City. 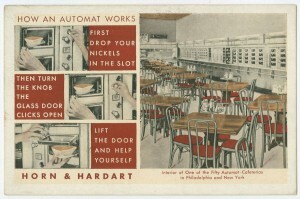 This postcard, a colorful marketing device for the chain, boasts an easy three-step process for procuring an Automat meal. The quick, simple system, sometimes available twenty-four hours a day, made meal times easier for the working population of both cities, especially laborers who worked irregular shifts and had short lunch and dinner breaks. 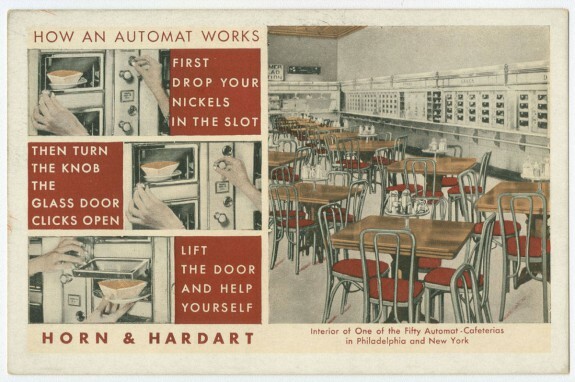 As Philadelphia and New York became increasingly industrial in the early and mid-twentieth century, H&H Automats were estimated to be feeding more than half a million people a day. As many city dwellers moved to the suburbs in the later half of the twentieth century, Automats began to suffer. Fast-food restaurants combined quick service with easy to use drive-thru windows, which intrigued a population with a growing automobile obsession. 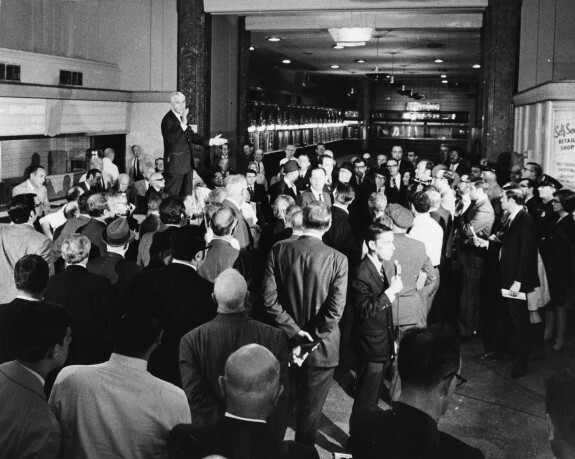 In this photo, from May 1969, the original Automat on Chestnut Street is auctioned off. After the restaurant closed, a pharmacy occupied the building for some time, and kept the original, ornate façade intact. As of 2013, 818 Chestnut Street is not occupied, and the once highly frequented building has a “For Sale” sign in the window. Beloved by generations of diners and immortalized in art, song, cinema, and poetic verse, Automats, also known as “automatics” or “waiterless restaurants,” were popular manifestations of an early-twentieth century modernizing impulse. Influenced by studies of scientific management by Frederick W. Taylor and the widespread use of the assembly line, the Automat removed the process of ordering food through a professional waitstaff and allowed customers a faster dining experience via coin-operated vending machines. Designed to streamline dining out while offering a broad choice of freshly prepared menu items, Automats were integral features of Greater Philadelphia’s restaurant industry from the early 1900s through the mid-1960s. Automats first appeared in Germany and Scandinavia in the 1890s. The first Automat in the United States opened in 1902 near New York’s Union Square. However, it failed to gain mass appeal and closed three years later. The Philadelphia area’s first Automat is credited to Joseph Horn (1861-1941) and Frank Hardart (1850-1918), whose local baking company imported the technology from Quisiana, a Berlin-based manufacturer. While European Automats were small, novelty-like affairs with unreliable brass machines, the American version pioneered by Horn and Hardart was larger and grander, with Art Deco accents, chrome paneling, stained glass windows, vaulted ceilings, and improved mechanization. Philadelphian Horn and New Orleans transplant Hardart had operated luncheonettes and bakeries in Center City since partnering in 1888. For their first Automat, they chose a site at 818 Chestnut Street. It proved an immediate sensation. After it debuted June 9, 1902, the Philadelphia Inquirer noted that Horn and Hardart had solved the city’s “rapid transit luncheon problem” of feeding people on the go. Their official slogan, “less work for mother,” affirmed their goal for faster restaurant service. Customers from politicians and factory workers to secretaries and policemen enjoyed a plethora of food choices and comparatively low cost. For less than fifty cents, diners could eat three meals a day. With breakfast, lunch, and dinner items in climate-controlled glass cases that could be quickly accessed, the Automat not only appealed to the urban masses but with its speed and consistency, marked the rise of the fast food industry in the United States. Horn and Hardart opened their second Automat in 1905 at 101 S. Juniper Street, third in 1907 at 909 Market Street, and a fourth in 1912 at 21 S. Eleventh Street. Initially, cooks and prep kitchens were housed on site in the rear or basement. To maintain quality as the company grew, food preparation was moved to a central commissary at 202 S. Tenth Street, where board members tested menu items daily. 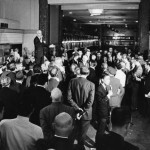 Philadelphia’s Automats catered to specific crowds: stevedores, who worked irregular hours, preferred the twenty-four-hour location at 234 Market Street; Jeweler’s Row merchants and Gimbel’s employees frequented 818 Chestnut; the Eleventh and Arch Automat “reserved” nightly a table for prostitutes; politicians and judges frequented 1508 Market Street; and insurance salesmen gathered at 6006 Market Street. By 1932, the company had forty-six restaurants in Philadelphia, of which fewer than half contained Automats. Including the company’s New York locations (the first appearing in 1912), by 1940 Horn and Hardart fed 700,000 people each day. The Automats’ “nickel-throwers,” women who gathered daily thousands of coins, became a citywide fascination. Following World War II and mass migration to the suburbs, the popularity of Automats in Philadelphia, which peaked during the Great Depression, waned. Fast food chains such as McDonalds developed drive-thru windows that served the region’s growing car culture. Trying to capture suburban customers, Horn and Hardart opened retail stores and cafeterias in Northeast Philadelphia, Jenkintown, Willow Grove, Havertown, and Wilmington, Delaware. Hoping to revive the Automats’ popularity, in 1961 they sought and received liquor licensing for their location at Sixteenth and Chestnut Streets. Yet competition and changing dining tastes as well as the company’s diversification, labor troubles, and expansion spelled trouble. Urban renewal also abetted the Automat’s demise. In 1965, the Philadelphia Redevelopment Authority forced Horn and Hardart to close their commissary to make way for Thomas Jefferson University’s dormitories. The following year, the Sixteenth and Chestnut building was demolished and replaced with a movie theater. In May 1969, the original Automat at 818 Chestnut Street was auctioned and its interior donated to the National Museum of American History. In 1981, Horn and Hardart filed for bankruptcy and many of its restaurant buildings were converted into McDonalds and Gino’s Hamburgers outlets. Finally on May 12, 1990, Greater Philadelphia’s last Automat, located in Bala Cynwyd, shut its doors. Stephen Nepa teaches history at Temple University, Rowan University, and Moore College of Art and Design. He has written for Buildings and Landscapes, Environmental History, Planning Perspectives, and other publications. He received his M.A. in history from the University of Nevada and his Ph.D. in history from Temple. Diehl, Lorraine B. and Marianne Hardart. 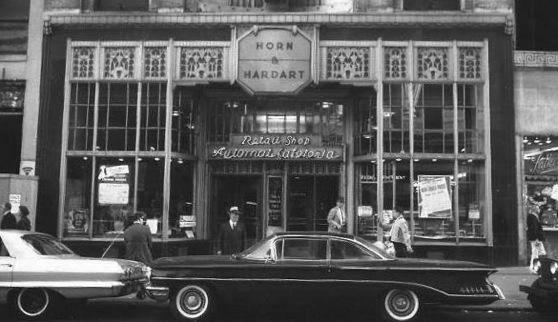 The Automat: The History, Recipes, and Allure of Horn and Hardart’s Masterpiece. New York: Clarkson Potter, 2002. Langdon, Phillip. Orange Roofs, Golden Arches: The Architecture of American Chain Restaurants. New York: Knopf, 1986. Springarn, Lawrence P. “Horn and Hardart, New York 1935.” Salmagundi 65 (Fall 1984): 119-20. Restaurants Collection and Images, Urban Archives, Special Collections Research Center of Temple University Libraries, Samuel L. Paley Library, 1210 Polett Walk, Philadelphia. Site of first Horn and Hardart Automat, 818 Chestnut Street, Philadelphia. Original wall section in National Museum of American History, Smithsonian Institution, Washington, D.C.
Born in Philadelphia in 1938 and worked in the food distribution business for 30 years and having ate, visited and delivered to Horn and Hardarts, a friend says there was an H & H at Front and Girard Sts., but I say no. Does anyone know for sure who is right? Worked In Horn & Hardart Retail Bakery on Fifth Street below Olney Ave., Phila., PA 19120.
the window every morning, cleaned the shelves. Great job for that age. Need a picture of one of the stores. Any idea where I might find one. was the one who made the Flowered Napkin Corsages soon everyone was doing the same thing. She won a prize for that. The one prize I am so proud of today is The Glass Shields over the Salad Bars you see today. Back then they were called sneeze and cough protectors.. anyway that was my Mom’s Idea. Every time I go to a Buffet or salad Bar I think of my mom and smile. Her name was Susan Lois Bascou but, she went by Lois Bascou. I know it was in one one of the Highlight Magazine but, do not know which one. I also worked in the office and was in the Winter 1961 Highlights Magazine—-I was a Doll in the Christmas Party for the children. 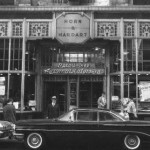 To me Horn & Hardart was the best Company to work for. My mom did for years. I went to Conwell Elementary School, Philadelphia, Pa in the 40s along with my two other sisters. Horn and Hardart’s was only a block away from our school. My mother would give us each money to eat our lunch once a week to eat at the automat. “Oh” happy days. We all thought it was such a big deal putting nickels in the machines and getting a good hot meal……like magic……it was something very special. I really loved the beef pot pie and so did our younger sister. My middle sister couldn’t wait for the Lemon Pie. Everything was so delicious. Does anyone out there have the recipe for H&H beef pot pie. I would be so happy if I could locate one.